← Is Customer Service a Lost Art? As I was thumbing through some new posts on www.pinterest.com the other night, there was one particular canvas that caught my eye. I had to “PIN” it to my “Inspirational” page. It said I was covered by His feathers. I then reflected back to a college speaker we had in chapel one day. Typically, I either didn’t GO to chapel or it was a social or study time. Not too many students were there by choice. But on this particular day, I paid attention to the words that were spoken. The following is a paraphrase. I cannot tell you the speaker’s name, as it was thirty years ago! This is what I do recall. I will never forget this illustration. Haven’t we all been there? Broken. Seemingly our lowest place in life. We’ve felt we’ve lost everything, no one cares about us, God has forgotten us and certainly, nothing can ever be the same. And then there’s a little ray of “HOPE”. It can sneak up when we least expect it. We only need that glimpse of hope, and it can begin to sprout into more hope. Who knows where that may lead. And I guess that’s my story for today. I just want to remind you to hang in there. I wanna remind ME to hang it there, too. No matter what you may be going through, you are of more value to HIM than the sparrows. “Are not two sparrows sold for a farthing? and one of them won’t fall to the ground without your Father. But the very hairs of your head are all numbered. Do not fear, you are of more value than many sparrows” (Matthew 10:29-31). This entry was posted in Uncategorized and tagged covered, hope, sparrow, The Sparrow. Bookmark the permalink. E’vn the raven God will feed. From His bounty, hath it;s need. Then shall I not trust Thee, Father? I cannot quote it word for word, but I used to have a little plaque that said something about the woods would be very silent, if only the birds with beautiful voice sang. I have always thought birds were facinating things. I’m glad Our Father is so kind as to even care about the sparrow. How much more He must care for us. Oh Paula, that is one of my all time favorite verses. I have kept that little reference on a scrap of paper in my wallet for years. I can’t tell you how many times I have read that when life was just about to overwhelm me. Our daughter, Lisa, had her 3 hour Heart Ablation procedure today. The doctor decided to keep her overnight as her heart was doing some strange things. I’m so glad they didn’t send her home because we are about 1/2 hour from the hospital, and it would have really scared me. 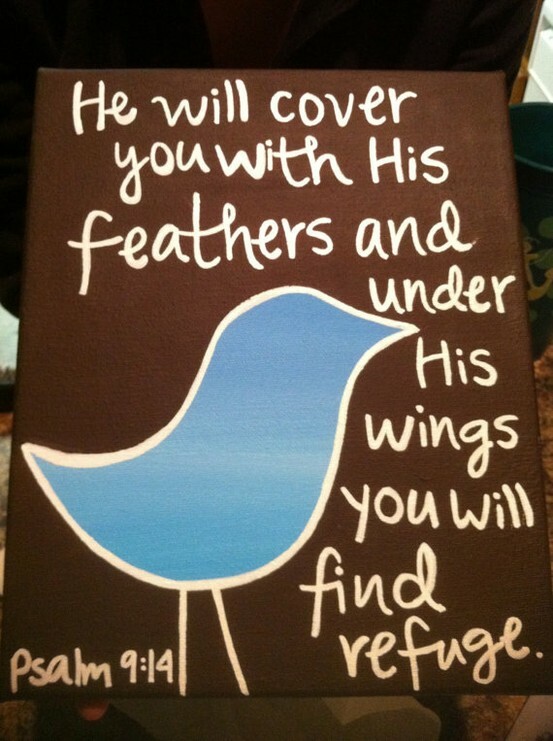 So God has his feathers wrapped around her tonight and hopefully she will get some sleep under His wings. All prayers appreciated. And I LOVE IT!! THANK YOU!!! Found you through the Grow Your Blog hop! Showing you some bloggy love by following you via Facebook. p.s. I’m in OK, too! Awesome, Tera! Thanks for finding me! What part of OK? Although I’m a few days late reading this, it meant a lot to me today. I’m kinda low today as well; not knowing where I’m going next and feeling pretty lonely. Thanks for reminding me I am never truly alone.